Deliver exquisite style to the table with the artisanal Ruffoni Symphonia Cupra 1.5-Quart Covered Casserole that unites the enduring legacy of traditional Italian copper craftsmanship with culinary performance for the ultimate gourmet cookware. For generations to come, the jewel-like, hand-hammered copper exterior of Symphonia Cupra will enhance the aesthetic of any home and kitchen while providing epicurean excellence. This heirloom-quality piece delivers impeccable performance by means of a copper-wrapped aluminum core for extraordinary heat conduction and a bonded stainless steel interior to assure durability and effortless cleanup. It's perfectly poised to help prepare a spicy Cajun shrimp mirliton or a fragrant spring lamb stew -- and deliver them to the table for an exciting presentation. Designed with beautifully shaped, mirror-finished cast stainless steel handles with stamped copper signets, the casserole is accompanied by a similarly adorned stainless steel lid. 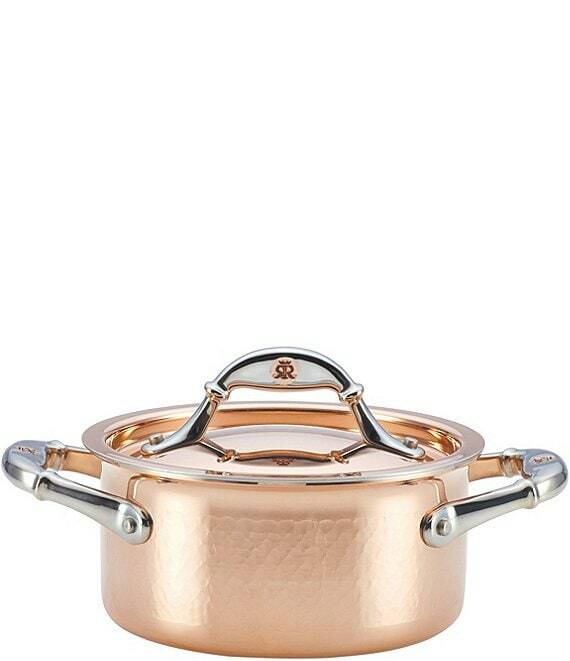 Oven safe to 450°F and suitable for all cooktops, except induction, this deluxe Ruffoni copper casserole is a beautiful addition to a home collection of Symphonia and Mini cookware to be treasured for a lifetime. From oven to beautiful table, the Ruffoni Symphonia Cupra 1.5-Quart Covered Casserole provides first-class culinary style and gourmet cooking performance.